Alaska’s volcanoes, like its abundant glaciers, charismatic wildlife, and wild expanses inspire and ignite scientific curiosity and generate an ever-growing source of questions for students in Alaska and throughout the world. Alaska is home to more than 140 volcanoes, which have been active over the last 2 million years. About 90 of these volcanoes have been active within the last 10,000 years and more than 50 of these have been active since about 1700. The volcanoes in Alaska make up well over three-quarters of volcanoes in the United States that have erupted in the last 200 years. In fact, Alaska’s volcanoes erupt so frequently that it is almost guaranteed that an Alaskan will experience a volcanic eruption in his or her lifetime, and it is likely they will experience more than one. It is hard to imagine a better place for students to explore active volcanism and to understand volcanic hazards, phenomena, and global impacts. 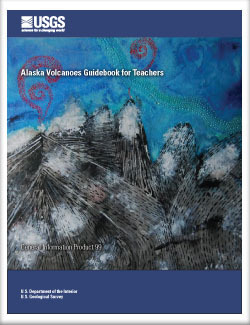 Previously developed teachers’ guidebooks with an emphasis on the volcanoes in Hawaii Volcanoes National Park (Mattox, 1994) and Mount Rainier National Park in the Cascade Range (Driedger and others, 2005) provide place-based resources and activities for use in other volcanic regions in the United States. Along the lines of this tradition, this guidebook serves to provide locally relevant and useful resources and activities for the exploration of numerous and truly unique volcanic landscapes in Alaska. This guidebook provides supplemental teaching materials to be used by Alaskan students who will be inspired to become educated and prepared for inevitable future volcanic activity in Alaska. The lessons and activities in this guidebook are meant to supplement and enhance existing science content already being taught in grade levels 6–12. Correlations with Alaska State Science Standards and Grade Level Expectations adopted by the Alaska State Department of Education and Early Development (2006) for grades six through eleven are listed at the beginning of each activity. A complete explanation, including the format of the Alaska State Science Standards and Grade Level Expectations, is available at the beginning of each grade link at http://www.eed.state.ak.us/tls/assessment/GLEHome.html. Adleman, J.N., 2010, Alaska volcanoes guidebook for teachers: U.S. Geological Survey General Information Product 99, 348 p.
Chapter 5 Alaska's Volcanoes and You!